The Keystone B-4 was a biplane bomber, built by the Keystone Aircraft company for the United States Army Air Corps. The first B-3A (S/N 30-281) was converted to Y1B-4 configuration with the addition of R-1860-7 radial engines and low pressure tires. Because of more powerful engines, the performance of the Y1B-4 was a slight improvement on the B-3, but the only difference between the two planes was their engines. On April 28, 1931, the army ordered 25 improved Y1B-4s as the Keystone B-4A. 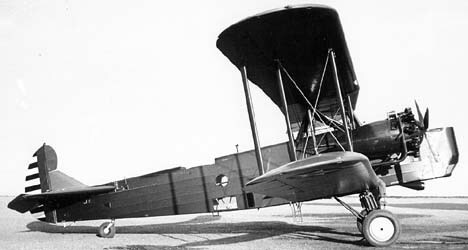 This production version was part of the last biplane bomber order made by the Army Air Corps (along with 39 B-6As, identical in all respects except their make of engine), and the B-4As, delivered between January and April 1932, were the last biplane bombers delivered to the Air Corps. B-4 was the last of the Keystone biplane bombers ordered by the U.S. Army in late 1931. These aircraft were used primarily as observation and reconnaissance aircraft as early as 1934 when the Martin B-10B went into operational service. Some remained in service into the early 1940s. Seven aircraft ordered but delivered as the Y1B-4 and Y1B-6 with different engine installations. Five pre-production aircraft, as the LB-10 but with two 575 hp (429 kW) Pratt & Whitney R-1860-7 engines. Production version of the Y1B-4, 25 built. Wikimedia Commons has media related to Keystone B-4.